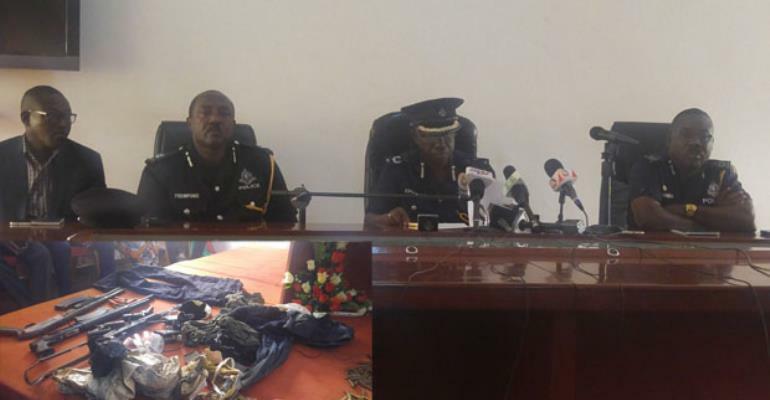 The Ashanti Regional Police Commander DCOP Akwasi Duku, has parried criticism that the police unlawfully killed seven people accused of being armed robbers at Poano, a community, near Anwiankwanta in the Bekwai Municipality on Tuesday. According to him, the deceased, whom police claim were believed to have killed L/Cpl Daniel Tieku attached to the SWAT unit and wounded L/Cpl Eric Nsiah, were all killed in a gun battle, fighting the police. Addressing the media at the regional police headquarters yesterday, DCOP Duku insisted that officers do not carry out arbitrary or unlawful killings as the deceased persons were members of the armed robbery group that attacked the police officers and some passengers onboard a Sprinter bus with registration number AC 644-15. He explained that the suspects first opened fire on the police after they ignored the signal to stop while onboard a Toyota Corolla with registration number BA 294 -15 and an unlicensed motorbike. He narrated that officers were deplored to patrol the area after picking intelligence that a group of armed men had planned to attack and rob passengers and mining sites at the Manso-Nkwanta area. DCOP Duku said the information suggested that the suspects were the same group of people that carried out the robbery operation at Manso-Kompesi on July 11, 2018 in which the police officer died. “L/Corporal Eric Nsiah and Daniel Tieku of FPU and SWAT unit were on operational duty at Manso-Kompesi onboard Sprinter bus AC 644-15 driven by Salas Kwame Kusi with other passengers onboard,” he disclosed and added that the police officers sustained severe gunshot wounds in the abdomen and left shoulder, resulting in dislocation. According to him, the masked men, numbering eight and wearing imitated military uniforms, were wielding AK 47 assault rifles, G-3 guns at the section of the road between Manso-Ayerebikrom and Agoroyesum. The driver and other passengers also sustained injuries and were rushed to St. Martin’s Hospital at Agoroyesum. On 12 July 2018, the police chief said a team from the regional police command, led by himself, discovered the weapons used in the robbery incident at Manso-Beposo – about two kilometers away from the crime scene in the forest. “Four AK47 assault rifles, one SMG number 197619, pump action gun and G-3 were retrieved, together with five boxes of AK47 ammunitions and 88 AK47 ammunitions loaded in four magazines. Meanwhile, families of three of the victims of the police shooting have no doubt about the innocence of their sons, disputing claims by the police that they were armed robbers. Speaking through the Asokore-Mampong Municipal Chief Executive, Halidu Seidu, at the police headquarters yesterday, the families insisted: “These boys were not armed robbers. They were never thieves, much less armed robbers. For them, the incident is a heartbreaking tragedy and therefore appealed to the authorities to carry out thorough investigations to unravel any mystery surrounding the incident.